As we update our campus, you may see projects and activities that are new and/or unfamiliar. Please visit this page to learn about activities you might observe in connection with campus improvements. Garage repairs will begin on Monday, January 21st. Repairs will begin with the replacement of the south stairwell (closest to the Harries Pavilion), requiring us to close access to this stairwell at every level. This phase of repair is expected to complete in four weeks. This week, demolition of the 9 hospital owned properties located on Walnut Crescent, George Street and Claremont Avenue is expected to complete. A reminder to our neighbors: In an effort to reduce waste, the existing masonry will be crushed and recycled to build the foundation of the new medical office building. Please expect demolition noise during normal business hours (7 a.m. - 4 p.m., Monday through Saturday). On Tuesday, July 10th at 11 p.m. Mountainside Medical Center will be breaking ground on the anticipated medical office building. In attendance will be Jon F. Hanson, Norman A. Feinstein, and Donald J. Engels from The Hampshire Companies and Jeff Sica of Circle Squared Alternative Investments, local and hospital officials, John Fromhold, FACHE, CEO of Mountainside Medical Center, Robert C. Garrett, Co-CEO of Hackensack Meridian Health, John Lloyd, Co-CEO of Hackensack Meridian Health, David Vandewater, CEO of Ardent Health Services, Frank Fekete, Chairman of the Hackensack Meridian Health Mountainside Medical Center Joint Venture Board, Tim O’Brien, COO of Mountainside Medical Center, Glen Ridge Mayor Stuart K. Patrick, and Montclair Mayor Robert D. Jackson. This week, we will also begin demolition of the houses located on the Walnut Crescent/George Street lot. Demolition is expected to take 4 days, with little to no interuption in traffic flow. On Thursday, May 24th to Friday, May 25th, the ambulance drop off zone in the front main circle on Bay Ave will be closed in order to complete the next phase of the PSE&G Emergy conservation project. A crane lift will occupy that space during this time. The circle will remain be open and in operation for patient drop off, pick up, and valet parking. Work will take place during regular business hours. Vehicles will still be able to access the main entrance circle, and no interruption to our ambulance services are expected. The cranes will be removed during off hours. Abatement work at the former School of Nursing and the hospital owned homes continues. Reminder: A Joint Planning Board Meeting with Monclair and Glen Ridge will be held this evening at 7:30 p.m. at the Montclair Fire Department, 1 Pine Street Montclair. Fencing around the 9 hospital owned homes adjacent to the open lot across from the Emergency Department and School of Nursing parking lot the will be installed on Wednesday, April 11th in preperation for abatement work on in these buildings. Abatement work will begin next week, with demolition to follow after completion. This work will take place during normal business hours. On Thursday, March 8th, representatives Mountainside Medical Center and the Montclair Development Review Committee met to discuss plans for the Medical Office Building prior to the application's formal joint planning board meeting with Montclair and Glen Ridge on March 26th, at 7:30 p.m. to be held at the Montclair Fire Department, 1 Pine Street in Montclair. Renderings for the new MOB site and new valet parking lot were presented. Read more about the meeting here. We are excited to report that the Glen Ridge and Montclair planning boards have approved the Mountainside Medical Center and Hampshire Companies co-redeveloper application to build a 44,000 square feet class “A” medical office building on the old school of nursing property. The 3 story medical office building will accommodate over 60 providers of varying specialties, ensuring that you have more options and more access to premier care for you and your family. Along with the medical office building will a new parking, improved traffic ways, and upgrades to landscape - including a green space. What happens next? The unoccupied, hospital owned properties along Walnut Crescent, Claremont Avenue and George Street will be leveled to create the new parking lot. Timing and details are still to be determined. We encourage you to continue visiting this site for additional details and upcoming communications. This week, Mountainside Medical Center will begin some necessary maintenance of our parking garage, which will require us to vacate 2 floors. These improvements will take approximately 4 weeks, and is not expected to cause any disruption in traffic patterns. During this time, the township of Montclair has granted us permission to use the Walnut Crescent/George Street lot as a temporary parkig location at peak hospital hours of operation. To accomplish this, a portion of the chain linked fence will be removed and our valet team will be providing parking services for our employees. Please be advised that several parking spots will be blocked off by the Mountainside Medical Center Security Department. To avoid ticketing, towing or damage, please park in the parking deck located on Walnut Crescent. From April 13th through April 17th, the public EXIT LANE to the parking garage will be closed to repair damaged sections of the driveway. Visitors may exit through the employee exit, located on the oposite end of the parking garage. A parking lot attendant will be stationed for assistance. On Friday February 2 and Monday, February 13, Verizon Wireless will be changing the hospital's antennas to enhance wireless connections. The corner of Bay Avenue and Highland Avenue will be temporarily closed to traffic from 9am-5pm. A site survey is being conducted. Survey areas include the surface parking lots, the open field across from the Emergency Department and other areas of the hospital campus. Site surveys provide information for design, project estimates and a variety of other tasks associated with the Medical Office Building project. During the week of January 11th (including the weekend) the Montclair Fire Department will be on site at the vacant School of Nursing Building to conduct training drills for firefighters and fire officers. On Friday, December 18th from 8 am to 4 pm you may observe large plumes of steam from the hospital’s new steam silencer. HackensackUMC Mountainside recently invested $18,000 to install a boiler steam silencer to lessen the amount of ambient sound from normal, day to day boiler operations. On Friday, December 18 the New Jersey Department of Environmental Protection (DEP) will be on site to conduct an emission test of our new energy efficient boilers at 100% capacity. The testing will be conducted in accordance with DEP protocol and will produce significant amounts of environmentally safe steam. Thank you for your patience and cooperation while we conduct this important testing to ensure that the system is working properly. On Monday, October 19 from approximately 8 am to 5 pm a crane will be located on Highland Avenue near the hospital’s Harries Pavilion entrance. HackensackUMC Mountainside recently acquired a new fully loaded, Siemens MAGNETOM Aera 1.5 Tesla MRI machine; the crane is necessary for the de-installation of the existing machine. Once installed, the MRI equipment upgrade will provide our community with access to the most up-to-date MRI technology. On September 16-17, representatives from Atlantic Traffic & Design Engineers will be onsite to conduct fieldwork related to a Parking Supply and Utilization Study. This study is necessary for two reasons: 1) to provide information to Montclair and Glen Ridge related to their re-zoning process currently underway for the new Medical Office Building; 2) to determine the number parking spaces needed for the new Medical Office Building. Representatives from Atlantic will be on-and-around the campus from 6:00 am – 8:00 pm both days. On Wednesday, September 3 from approximately 7 am to 3 pm a crane will be located on Highland Avenue near the hospital’s Harries Pavilion entrance. HackensackUMC Mountainside recently acquired a new fully loaded, Siemens MAGNETOM Aera 1.5 Tesla MRI machine; the crane is necessary for the de-installation of the existing machine. Once installed, the MRI equipment upgrade will provide our community with access to the most up-to-date MRI technology. Later in the week of July 6th, representatives from an engineering firm will be on site to survey proposed parking locations for: Dialysis Ambulance parking at 1 Bay Avenue, and additional Emergency Department parking in the vicinity of Walnut Crescent. Beginning on or about April 28th and continuing for approximately 4 weeks, contractors will work on underground utility lines for HackensackUMC Mountainside in the areas of Ridgewood Road, Forest Avenue and Sherman Avenue. This project will help ensure reliable electric power for the hospital, especially during extreme weather events. The utility work may involve lane closures and traffic re-routing as crews work in the area. Local law enforcement will be assigned to the area to assist with traffic. Routine antenna upgrades are planned for April, weather permitting. Work is scheduled for 8 am – 4 pm and may require a man-lift. A Glen Ridge police officer will be assigned to the area if a man-lift is needed. This week, an environmental survey will be conducted on hospital owned properties on Walnut Crescent and across from Emergency Department. The survey will provide a general overview of environmental matters related to development of the site. On Sunday, March 22nd, land surveyors will be on site at the School of Nursing to assess tree locations and other physical features. This week on campus, engineers will be drilling into the ground to pull out core samples to get an understanding of the rocks and types of soil that exist beneath our feet. The engineers and their equipment will be on campus on Friday, January 16th around the perimeter of the current buildings, on the lawn area and in the parking lot. The information provided from the samples will help us to prepare plans for the foundation of the new medical office building. 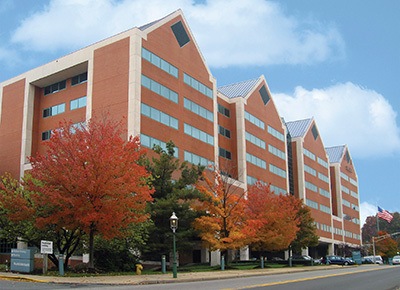 This month, our School of Nursing moved to their new home on the campus of Montclair State University. As we were cleaning out the old building, we found a treasure trove of memorabilia in the basement, representing many different eras in the history of the School of Nursing. In the next few weeks, we will be taking inventory of the items with the expert help of both the Glen Ridge and Montclair Historical Societies. We are grateful for their assistance in helping us preserve these artifacts. It’s moving day! The HackensackUMC Mountainside School of Nursing and Partners for Health Foundation are relocating It’s moving day! The HackensackUMC Mountainside School of Nursing and Partners for Health Foundation are relocating to new their new homes. Montclair State University welcomes the School of Nursing and the Partners for Health Foundation is unpacking at 54 Plymouth Street, Montclair. Those big green containers in front of the building are here temporarily to help with the office clean out. A site survey is being conducted. The site survey will provide information for design, project estimates and a variety of other tasks associated with the Medical Office Building project. A traffic survey is also being conducted. The traffic survey will quantify current traffic conditions and provide information related to transportation matters in connection with the Medical Office Building project.